TiE50 is turning 10 in 2019! We’re pleased to invite all startups worldwide, particularly early stage companies, to participate and benefit from significant exposure to venture capitalists, angels, and entrepreneurs. Now in its tenth year, the prestigious TiE50 awards recognize the top technology and technology-enabled startups at TiEcon, the world’s largest entrepreneurship conference. Since its inception, 84 percent of TiE50 winners and top startups have been funded at a total of over $1 billion. Many of these companies went on to acquisition or a public offering, with 29 of the exits at over $100 million: FireEye (IPO), Mulesoft (IPO), Pearl Therapeutics (acquired by AstraZeneca), and VeloCloud (acquired by VMware). Read more from a couple of past TiE50 winners. TiE Silicon Valley’s premier annual awards program is keenly contested by thousands of early- to mid-stage startups. “TiE50 has become a global brand that attracts thousands of tech startups worldwide. Last year, we screened more than 7,400 companies from 28 countries…Our program has gained notoriety over the past decade as a competition run with the highest level of integrity and vigorous screening and judging by domain experts. TiE50 is one of the very few competitions out there without pay to play.,” said Kamal Anand, TiE50 Program Chair. Applications are rigorously reviewed by a panel of judges including venture capitalists, angels, successful entrepreneurs, and corporate executives. A nominal application fee of $500 includes a complimentary single two-day pass to the TiEcon 2019 conference. “As a 27-year not-for-profit dedicated to fostering entrepreneurship and with a global footprint of half million entrepreneurs, enterprise executives, and investment professionals, at TiE Silicon Valley we take pride in the fact that we have created, TiE50, a strong 10-year old brand for recognizing high potential startups,” said B.J Arun, President, TiE Silicon Valley. TiE50 partners with TheBizPlanner for the infrastructure to run the awards program. All 2019 applicants must register on TheBizPlanner to apply for the TiE50 Awards Program. All information is kept confidential. Read more and apply here. 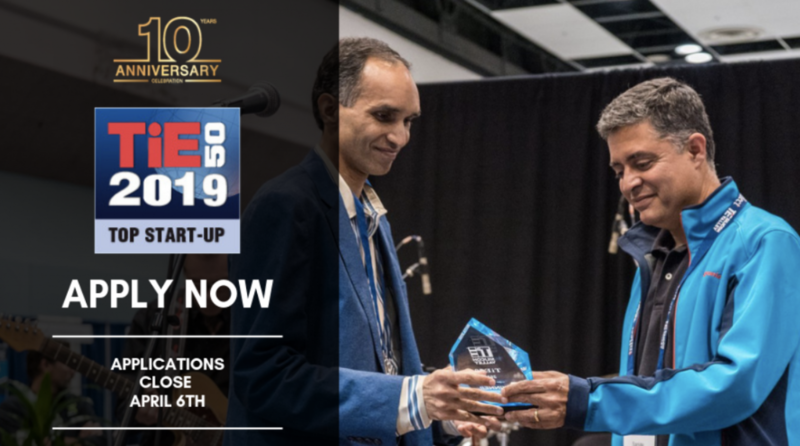 This year we will also select 10 of the TiE50 winners for an exclusive opportunity to present to a live audience including venture capitalists, angels, corporate executives, and successful entrepreneurs for additional feedback and exposure during the Startup Showcase Track on May 11 at TiEcon 2019. Don’t delay! Apply here now. The TiE50 Awards 2019 application process is open through April 6 at midnight PDT. Winners will be announced at TiEcon 2019 on May 10 and 11 at Santa Clara Convention Center. Share this with your network today!